IN SEARCH OF FATHERHOOD(R): PRAYING FOR A BETTER WORLD: JEROME TEELUCKSINGH, Ph.D.
PRAYING FOR A BETTER WORLD: JEROME TEELUCKSINGH, Ph.D.
"The International Day of Prayer for Men and Boys is a call for peace; it is a call for bringing hope to the hopeless. It is a call for transforming our spiritually, psychologically and emotionally toxic communities into a loving, nurturing, and spiritually vibrant oasis. It is a call to end the “school-to-prison” pipeline. It is a call to end the rising suicide rate of Men and Boys." This quotation from the 2015 press release of Ms. Diane Sears (USA Coordinator – International Men’s Day) is relevant for today's world. I believe that prayer from a genuine heart can transform the world. Many will agree that we live in a confusing world with changing values, strange behaviours, hollow morals and questionable ethics. There is often a blurred line between the truth and lies or right and wrong. Our role models sometimes disappoint us. We cannot lose faith and believe that our society will become worse or events are unchangeable. I have many weaknesses but prayer has been a guiding light in my life. On a daily basis, I face temptations but prayer has allowed me to understand the difference between right and wrong. This year, I again want to encourage persons and institutions to observe the International Day of Prayer for Men and Boys. who will inspire the current and future generations. Continue praying for the millions of sick persons who cannot afford proper health care. Pray for the volunteers and medical personnel who assist the terminally ill persons. they will be treated fairly and with respect. Let us pray for boys and men who are incarcerated. pray that the guilty will learn from their mistakes. 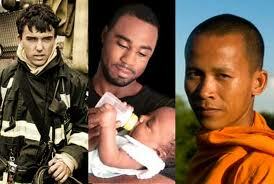 We pray for men and boys to be more tolerant and accepting of different cultures and religions. Continue praying for the many persons who have no access to clean drinking water. who are carrying the future of humanity. give them strength to leave or seek counselling. let them be aware of the need to change their lives and thinking. Pray for those who have allowed vices to endanger their lives and others. We pray for world leaders to understand the need for permanent peace. and concentrate more on helping and uplifting humanity. Jerome Teelucksingh, Ph.D. is the Founder of International Men's Day, Chairman of the International Men's Day Coordination Committee, faculty member in the History Department at the University of West Indies, an author, and humanitarian.